The Israel Cancer Association endeavors to limit tobacco use through informative campaigns aimed at preventing addiction to smoking and which promote smoking cessation and anti-smoking legislation and enforcement. The Israel Cancer Association (ICA) produces educational and informative material on the harmful effects of tobacco use and smoking prevention. Hundreds of thousands of copies of this material is distributed to general population, free-of-charge. The material is also distributed in Arabic and Russian. These educational materials include various stickers, posters, information brochures about the health hazards of smoking and hookah smoking, smoking cessation guidelines and more. The ICA "Telemeida" teleinformation hotline receives many calls from citizens seeking information. The ICA also distributes information to the public at large through its website and a child-oriented website. The ICA initiates and produces media information campaigns aimed at heightening awareness of the harmful effects of smoking and reducing the smoking rates in Israel. As part of this initiative, every year, the ICA leads an information campaign aimed at relevant sectors of the population. "The Shy Ones" public service announcement: a joint collaborative effort between the ICA and the Ministry of Health to reduce the exposure to the hazards of passive smoking and to encourage the public to get actively involved in eliminating this phenomenon. "Smoking a hookah can kill - just like a cigarette": an ICA information campaign in collaboration with the Ministry of Health to increase awareness of the harmful effects of hookah smoking and to reduce its use among teens. 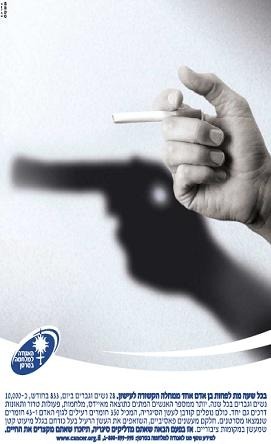 "Smoking Causes Impotence"/"the Link between Cigarette Smoking and Impotence": ICA information campaign conceived in view of the constant need to find innovative ways and new concepts to persuade young people to stay clear of this hazardous habit. The Israel Cancer Association invests endless resources in collaborative efforts with teen-oriented media channels to speak to teens in a language they understand. Messages are conveyed to teens in camouflaged and sophisticated ways. The ICA has produced many TV programs in collaboration with the Kids' Channel (Arutz Hayeladim) to communicate messages that are appealing to children. For the past three years, the ICA has been running the website www.kid.org.il, aimed at children between the ages of 5 and 13. This unique website addresses children in their language and provides a captivating and entertaining online experience alongside a learning experience which demonstrates how to protect oneself from harmful exposure to the sun and cautioning about the hazards of smoking. The website is accompanied by an announcer and does not require reading skills. The ICA organizes broad-based lectures for school students within the education system across Israel and runs smoking prevention programs for teens. ICA recruits specially trained instructors to lecture to teens at schools, in community centers and within youth movements. Audio-visual materials and other tools are made available to these instructors to help them achieve their targets. The ICA is a partner in the "Amitim" project ("Colleagues") of the Ministry of Health, which trains teens who are public opinion leaders among their peers, to act within the classroom to prevent their counterparts from picking up this hazardous habit. To date, the project has been run in numerous schools across Israel and 2006 saw an "Amitim" seminar in Arab society, held in Arabic. The ICA consults and assists in the development of comprehensive programs tailored for all schools across the country, to reduce the smoking phenomenon among teens, as well as their exposure to secondhand smoke. In recent years, an emphasis has been placed on programs to implement the "Smoke Free Schools" policy. The ICA has initiated, written, and produced training programs and networks geared toward professional teams. One of the programs is "The Non-Smoking Class of the 2nd Millennium", in collaboration with the Dept. for Health Education and Promotion and Clalit Health Services. The ICA holds professionally-led smoking cessation workshops for the general population, at a subsidized price. The ICA also responds to requests of workplaces, kibbutzim and healthcare funds to conduct these workshops, consisting of 10 2-hour meetings. The workshops, moderated by professionals who are experts on smoking cessation, are aimed at teaching smokers how to stop smoking and provide them with coping strategies to avoid the temptation to start smoking again in the future, all within a supportive group framework. The experts also examine the ex-smokers' need for nicotine replacement therapy and smoking cessation medications, and instruct them how to use these remedies. The ICA also publishes informative materials on smoking cessation for those who seek to quit smoking on their own. The ICA also lent its assistance, in collaboration with the Ministry of Health and the Ministry of Education, in the training of Shefi (Psychological and Counseling Services Division of the Ministry of Education) counselors, as smoking cessation consultants in schools. The ICA also provides assistance to the IDF in promoting educational activities to further smoking cessation and to keep military bases smoke-free. Since the ICA first promoted the legislation of the prohibition of smoking in public places in 1983 - with Israel figuring among the first 10 countries to pass the ban on smoking in public places - we continue to promote and encourage the expansion of the content of this legislation in close collaboration with the Ministry of Health and the members of the Israel Council for the Prevention of Smoking, whose meetings are scheduled and convened at the ICA. Over the years, the ICA has initiated legislation to prohibit import of tobacco and smokeless tobacco products to Israel, thus putting an end this problem. Additionally, the ICA assisted in the drafting of amendments to the law which prohibited the advertising of tobacco products as well as in initiating the prohibition of the sale of tobacco products to minors; the ICA also participated in the formulation of legislation to change warning labels on cigarette packages, acted to promote legislation banning the use of terms such as "light", supported a bill to increase the fine for smokers and to impose a fine on restauranteurs/nightclub owners who do not act on preventing smoking within their demarcated area, and more. The ICA has addressed policy makers and relevant members of Knesset committees, particularly with regard to supporting the tax hike on cigarettes, and is actively involved in various meetings discussing this issue. From time to time, the ICA conducts public opinion surveys and publishes their results through the media. For instance, it recently published a survey indicating that 75% of the Israeli population supports the prohibition of smoking in restaurants and cafes. In another ICA-initiated survey, it emerged that 64% of the general population supports the prohibition of tobacco advertising.